Accuray Incorporated has announced that recently published data from two new studies demonstrate the benefits of the TomoTherapy System in the delivery of total body irradiation (TBI), a procedure commonly used to prepare patients being treated for leukemia and multiple myeloma for a bone marrow transplant. TBI involves irradiation of the entire body, elevating the need for precision, accuracy and homogeneity in radiation dose delivery. The TomoTherapy platform's unique architecture enables efficient and extremely effective delivery of radiation over large areas of the patient, making it a valuable part of the bone marrow transplantation conditioning regimen. In TBI treatments, radiation is administered to the patient as part of a multimodality treatment regimen, typically in combination with high-dose chemotherapy. The irradiation contributes to the eradication of malignant cells, especially those that are chemotherapy-resistant or in sites not easily reached by chemotherapy drugs. TBI also helps prevent the body's immune system from rejecting the healthy donor cells after the transplant. 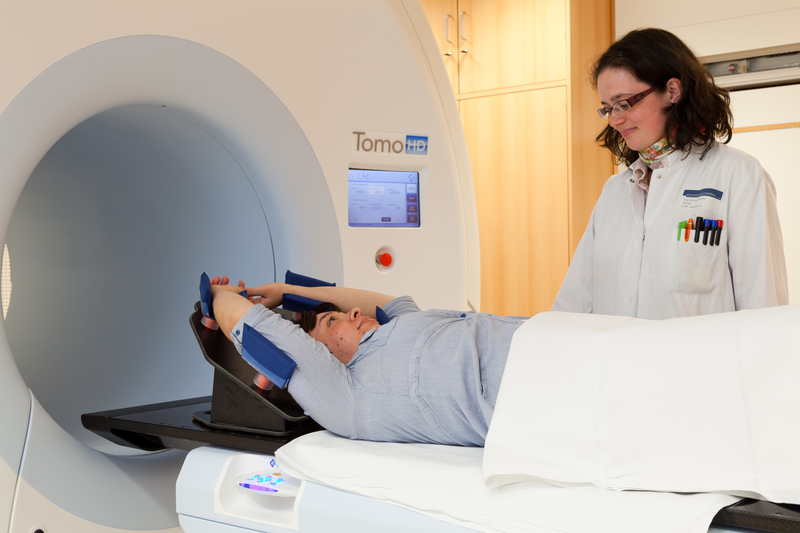 The TomoTherapy platform, including the next-generation Radixact System, has continuous gantry rotation and couch motion that enables helical delivery of therapy (TomoHelical). This treatment modality produces intensity-modulated radiation from 360 degrees around the patient over very long treatment fields, which significantly enhances the ability to achieve homogenous dose distributions for TBI, while also simplifying and streamlining the treatment delivery process. TBI treatments on conventional systems have been shown to pose a greater risk of over-dosing some areas and under-dosing others. Over-dosing may lead to toxicity and under-dosing means that the goal of eradicating the tumor cells is less likely to be achieved. "We took advantage of the TomoTherapy System's ability to deliver different radiation doses to very specific areas of the body at the same time to create an optimal treatment plan, providing one dose to accomplish TBI and simultaneously augmenting this with another dose to the sites that needed additional radiation," said Prof. Li, Jing, radiation oncologist and chief at the Helical TomoTherapy Center, Guangzhou General Hospital of Guangzhou Military Command. "We were extremely pleased with the results. Using TomoHelical mode we achieved satisfactory immunosuppression, excellent eradication of malignant tumor cells, and individual sparing of organs at high risk of radiation-induced toxicity, enabling us to achieve our clinical objectives." "The approach to TBI described in these studies is a wonderful example of our customers leveraging the advanced and unique capabilities of the TomoTherapy System to update traditional approaches and offer patients effective treatments with low rates of toxicity, results we would also expect to see with the Radixact System," said Fabienne Hirigoyenberry-Lanson, PhD, Vice President Global Medical and Scientific Affairs, at Accuray. "I'm thrilled that our customers take our technologies to another level and look forward to partnering with them to further improve the quality of care they give to their patients." Studies show Accuray TomoTherapy increases precision, outcomes for total body irradiation. Appl Rad Oncol.